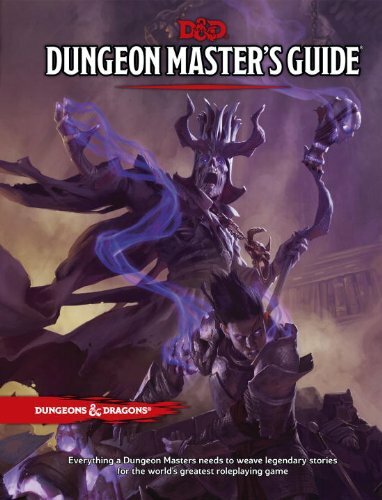 Coming off of reading the Player's Handbook and the Monster Manual it was really cool to dive into the Dungeon Master's Guide. It's basically a giant toolkit to help you create worlds and run the game. Most of the actual rules for playing the game moment to moment live in the Player's Handbook so technically you don't need the DM's Guide, but it's still really cool. There are all sorts of tables to roll on to randomly generate loot, dungeons, situations, stories, and almost anything you can think of. But, the part I liked the most were the leading questions that make you think. If you're trying to figure out your world or story or setting or whatever... this is the book you want to be scanning. It has so many cool ideas and hooks that you can take and run with. I see now why this is such a helpful tool for DMs. Now that I have a greater context through these books I think I'm going to look through the D&D starter kit adventure... because I see it sitting right on the shelf over there. I'll report back.